Bouchard Finlayson Galpin Peak Pinot Noir. Hemel-enAarde Valley boutique winery Bouchard recently ranked as the top red wine producer in SA at the 2017 South African Wine Index awards. Its Bouchard Finlayson Galpin Peak Pinot Noir scored 100 and was named the best Pinot Noir in SA (it’s also the 11th highest ranked wine in the country). This is the fifth year Bouchard Finlayson clinched the top spot in the Pinot Noir category. 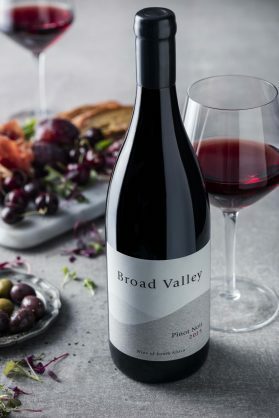 Situated at the northern end of the valley, Broad Valley Farm has released its maiden Pinot Noir vintage (2014) and it doesn’t disapp0int. Although the disclaimer on my desk advised that cellaring it will develop its complexity, at the weekend the perfect opportunity presented itself to open this exciting new wine. With herbaceous undertones, there’s a broadness to it. Paired with honey-baked pulled pork, this wine shines, but it will also work well with fillet tagliata, grilled veal with lemon and olive oil, or game. David and Leigh Kretzmar snapped up the 105ha property in 2009. After dabbling in producing French black truffles and debating the merits of commercial lavender, they focused on viticulture. Situated just 10km from Walker Bay, its location at the northern end of the Hemel-en-Aarde valley has given the farm the perfect terroir for growing the classic Burgundian cultivars of Pinot Noir and Chardonnay. Thank goodness they chose wine and not truffles.